“Space tourism doesn’t have to be rocket science,” reads the subheading of a New Scientist article about a proposed high-altitude passenger balloon concept that would take people to the edge of space. The “bloon” concept, by Spanish company zero2infinity, features a six-person pressurized capsule carried to an altitude of 36 kilometers (118,000 feet) by a giant balloon. Four passengers, paying €110,000 (US$142,000) each, will spend two hours at that altitude, gazing down on the Earth, before gently descending to a landing. It sounds like an interesting experience: an opportunity to gaze down on the Earth at altitudes three times higher than a commercial jetliner in what appears to be a luxurious setting (according to a brochure describing the overall experience). It may turn out to be a profitable niche for zero2infinity. However, contrary to New Scientist, it is certainly not space tourism. And why isn’t it? For obvious reasons, the balloon is not going into space: while doesn’t have a sharp boundary like a national border, 36 kilometers is well below the altitudes commonly considered space, including the widely-accepted 100-kilometer the Kármán line. 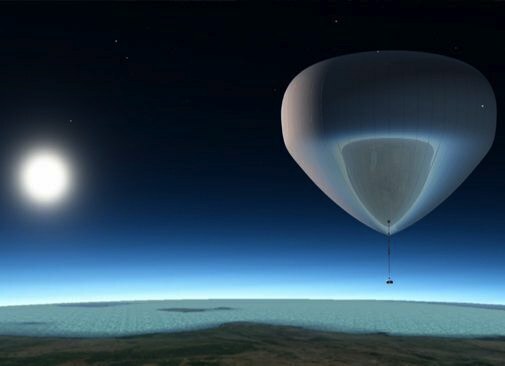 While there is some dispute about what altitude constitutes space (the US government, for example, awards astronaut wings at an altitude of 80 kilometers), the bloon flights still appear to fall far below those alternatives. Even zero2infinity markets its flights as “near-space”, using the term that emerged in the last decade for aerospace activities above altitudes commonly used by planes but below the Kármán line and other space boundary definitions. Well, perhaps: the “funfair thrills” of weightlessness (of much greater duration than possible on an aircraft) is widely cited as one of the primary reasons people are interested in space flight. There’s also the intangible benefits of the full experience: the view from space plus the sensation of weightlessness plus the other attributes of the flight. Suggesting one could save money by separating out the experiences (a balloon flight plus a zero-g flight, for example) is somewhat like arguing that one can save money on a trip to Hawaii or the Caribbean by staying home and going to an indoor pool and then a tanning salon. It’s not really the same. There’s another important difference between suborbital spaceflight and high-altitude ballooning. The former is arguably a means to a greater end: more frequent, less expensive, and safer spaceflight for a wide range of other applications. By leveraging the large potential customer base of thousands of spaceflight participants per year versus the roughly 100 satellites launched annually, it’s possible to support development of suborbital and eventually orbital vehicles that can open up new markets and applications that would otherwise be inaccessible with current vehicles. High-altitude ballooning, on the other hand, seems unlikely to be a stepping stone to either low-cost spaceflight or even broader terrestrial applications, other than scientific research that zero2infinity mentions in its literature. “So if you’ve always longed to travel into space but don’t want to trash the planet doing so, space ballooning is the way to go,” the New Scientist article concludes. Sadly, that conclusion is inaccurate: there’s limited, disputed evidence that commercial spaceflight will “trash the planet”, and a high-altitude balloon flight is not “travel into space”, something I’ve railed against in the past. High-altitude ballooning and suborbital (and orbital) spaceflight can coexist; the former can serve as something of an appetizer for the latter, even. But ballooning is not a substitute for spaceflight. I thought many of individuals who bought seats on the Soyuz didn’t like the term space tourist being used for personal spaceflight. And that is fair enough as states like Florida and Texas are more then happy to claim it to describe the millions visiting them each year to explore their space history. And it follows if visiting sites like KSC and JSC is space tourism then this type of venture, as well as XCOR flights, would qualify as well. So I make the following suggestion. Let’s call folks traveling to satisfying their interest in space as space tourists, including the millions who visit KSC and JSC each year. Then let’s call private individuals that actually fly into space (above 100 kilometers) for leisure and adventure “Adventure Astronauts”. This not only is a more descriptive term, it also places them in the proper tourist industry classification as Adventure Tourists. Meanwhile those who travel to space for business purposes, as have many of the private individuals that bought Soyuz rides, would be classified commercial astronauts, a term already in use by the FAA AST. This classification system is not only more descriptive, but is also far more functional in terms of space policy, regulation and marketing. For example, a key motivational goal for adventure tourists (like those climbing Mt. Everest) is the personal challenge and risks involved. So by using the term Adventure Astronauts you render the arguments that suborbital HSF needs to be “as safe as commercial air travel” null and void since doing so would be counter productive to the market served. It would also serve to bunt public outcry if there is an accident, since the public expects folks taking adventure risks to die occasionally, as on Mt. Everest. The public tends to feel in these cases that the folks involved need the risks and freely choose to take them. And under that system these balloon flights would be seen as both space tourism, given the key role of high attitude ballooning in HSF history, and adventure ballooning. Wow, something I can agree with you on Thomas. The travel industry already has a segment called “Adventure travel” (around $89B spent on it in 2009), so being an “Adventure Astronaut” would not be a big leap. However I don’t see the terms sticking in general usage, just as “pilot” is the generic term for someone that is a pilot, regardless if it’s for pleasure or work. Same with “tourist”, I think it’s generic enough to describe someone that is visiting from somewhere else, regardless if they are going to Cleveland or Low Earth Orbit. I was a balloon pilot for many years when I was younger and I have to agree with Jeff. Even the stratospheric balloons are still aircraft, not spacecraft. That said, I would still love to take one of these ultra-high altitude flights. High-altitude ballooning seems pretty great to me. You’re still surrounded by a near-vacuum, and the view will last a lot longer than a suborbital flight. I disagree with the Caribbean vs. tanning bed analogy. You could just as well make the analogy that ballooning is like going to the Caribbean without the obnoxious casinos or time-share spiel. Sure, some people will like the thrill ride, but for others, skipping the vomit-inducing parts of the trip will be a bonus. Reducing the risk and having a voluminous cabin to walk around in with plenty of amenities is a bonus in my opinion. Being locked into a claustrophobic tin can, peering through a tiny periscope, and urinating in your suit could be described as part of the “authentic Al Shepard experience”, but I’m willing to sacrifice the authenticity. It’s reasonable not to label ballooning as space tourism, though. What if the adventures were to be intentionally rocket like? Start donning a spacesuit, have a countdown. An adventurer presses a button which detaches their capsule from the ground. That capsule is attached by a stretched bungee cord to a balloon 1,000 ft in the air so you get the initial acceleration. At height, another adventurer presses a button, the capsule detaches so you experience weightlessness in the same trip. Parachutes deploy and you land in water. I would not blame zero2infinity for all its arguments against space vehicles at all, because at some point in time, someone has to pay for the ballons and all other associated cost. However, it is still space tourism. Remember that once you cross Amstrong’s line, you are no longer in the troposphere, you are over board, but a valid point from the opposing team that i agree with is, if its not Hawaii, its not the same thing as Hawaii. They might come up with ballons that will reach 86km soon, hopefully it does not get jammed by any sharp object in space or alien or “pooped” out in the air, but till then just give them some support and tell zero2infinity to tell their scientist to make very strong ballons for safety reasons.